Obviously this is not a low calorie meal. But at the same time, for a meal packed with this much flavor, it’s awfully low in calories. 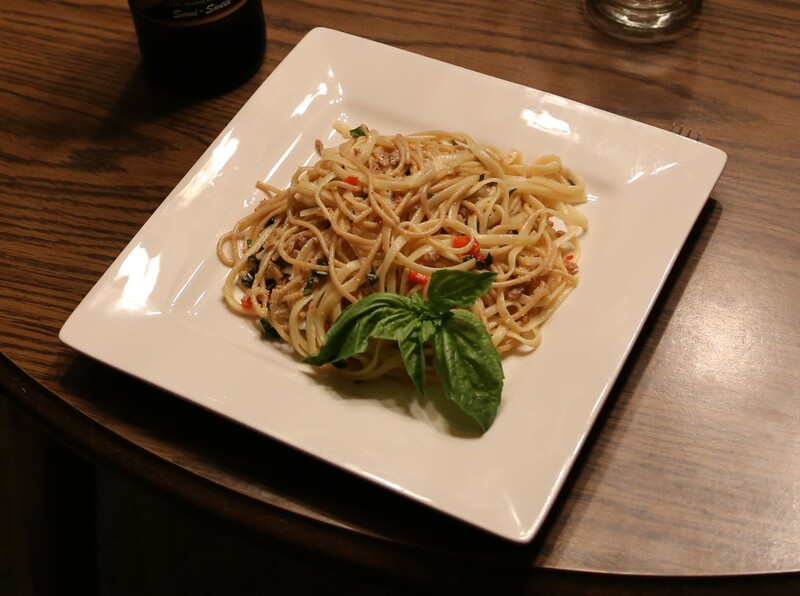 We started out researching the typical ingredients to Spaghetti Aglio é Olio (Spaghetti Garlic & Oil). There were all sorts of high fat recipes out there, due to the extreme amount of olive oil each of these called for. But when we cut the olive oil in half and finagled the rest of the recipe…well, let’s just say it worked. Some recipes called for anchovies, while others didn’t Both Shawn and I really enjoy the aromatic flavor anchovies add to pasta, so we made sure to include them. I realize they’re kind of strange to cook with, especially since they’re little slimy fish in a jar. But all you have to do is throw them in the hot oil, mix them around a bit, and they disintegrate. After that, it’s easy to forget you even used them. I wanted to add some more protein, so I opted for the sweet Italian sausage (sausage is salsiccia in Italian). That’s not a typical ingredient when it comes to Spaghetti Aglio e Olio, but depending on Parmesan cheese for protein didn’t sit well with me. Even though you’re only supposed to have 20% protein in your diet, you still need it, and dinner is often when you get the most. Whole wheat is better for you. Hands down. But I’m not a big fan of the texture/taste of whole wheat pasta, so we decided to cut it with the regular linguine. That definitely worked. The mixture of pasta really added to the dish, and because the spaghetti noodles were thinner, they weren’t as noticeable. I didn’t hear her complain. We also added the sweet peppers to add more vegetables, and made sure we had a ton of basil. When it comes to pasta without official pasta sauce, you want to make sure to use a lot of your flavor enhancers. This dish makes a huge batch (note the picture…and there’s still another third of the pan not in the frame). 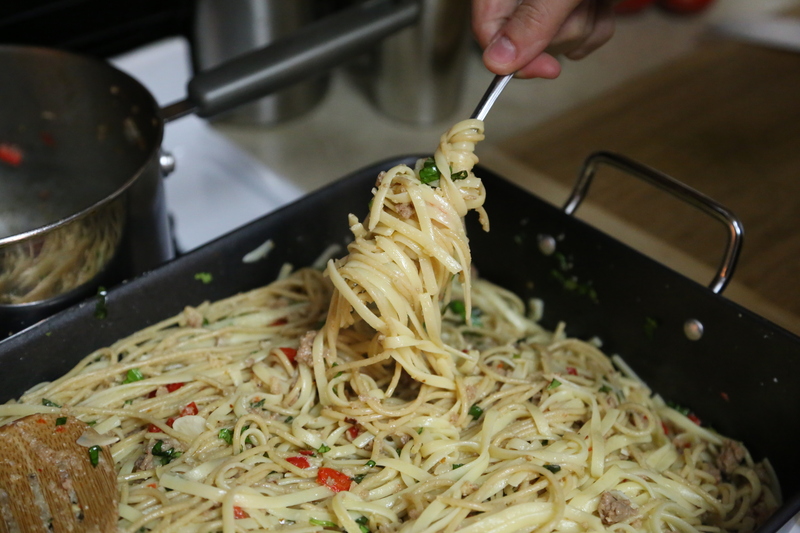 We even had to move the pasta to a roasting pan just to stir it! I’m sorry to say that I wasn’t able to measure out the exact serving sizes. If you’re making this for a lot of people but you still have the chance, dish it out evenly onto ten plates. That’ll help. Before I took a forkful of this pasta, I considered writing a note suggesting a decrease in pasta but keeping the rest of the ingredients the same for less carbs and more flavor. Don’t. This pasta packs a punch. In fact, if you don’t like food with a little kick, you may want to reduce the crushed red pepper. But for those of you looking for a flavorful, healthier version of Spaghetti Aglio é Olio, give this a whirl! Bring a large pot of water, sea salt, and 1 tsp olive oil to a rapid boil. Combine linguine and spaghetti and boil in the pot for 13 minutes or until desired texture is reached. Drain and set aside. In the meantime, combine sausage and sweet peppers in a saucepan over medium high heat. Break up sausage into crumbles with a wooden spoon, stirring constantly, for about 10 minutes or until sausage is browned. Remove from heat and set aside. Returning to the large pot, heat remaining olive oil. Add anchovies and stir constantly until anchovies break into little bits. Add garlic and stir constantly until garlic turns light brown, no more than 2 minutes. Add crushed red pepper and stir for 30 seconds. Pour the sausage and sweet peppers into the pot and stir until heated through. Carefully add the drained pasta to the pot, being careful to breakup any clumps. Remove from heat. Add the basil and Parmesan and toss well. Jenny Craig: Since this meal is so high in starch, this counts as a dinner plus either breakfast or your snack, depending which of the two you’d like to give up. But it can be done. Next Next post: Did I Mention I’m a Reenactor?